Simulation of the 2D Ising model on a square lattice. Is there a better alternative to MacIsing? Is MacIsing really the best app in Science category? Will MacIsing work good on macOS 10.13.4? 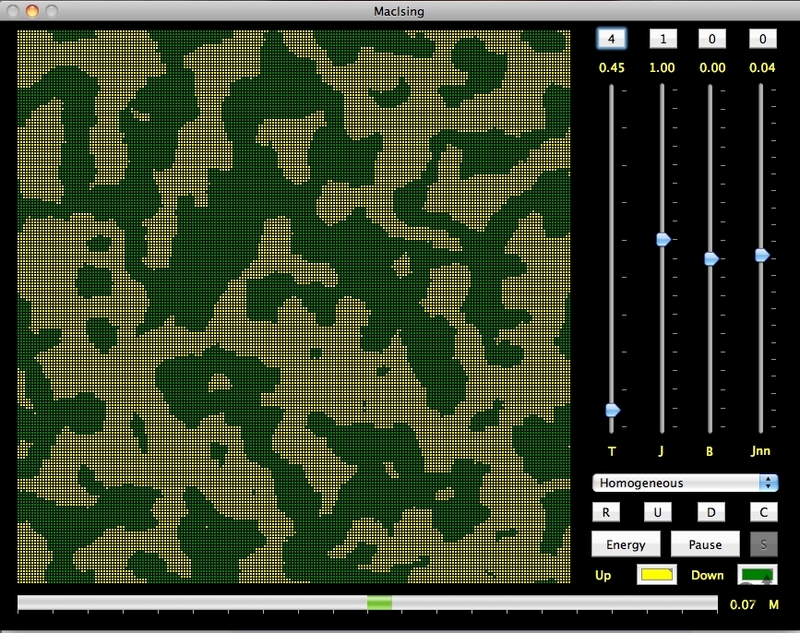 MacIsing is a freeware interactive Montecarlo simulation of the 2D Ising model on a square lattice. Nearest-neighbours and next-to-nearest neighbours interactions are considered and different configurations including interface between para- and ferromagnetic materials can be simulated. The simulation speed and the grid size (up to 600x600 spins) can be customized by the user. MacIsing needs a review. Be the first to review this app and get the discussion started! MacIsing needs a rating. Be the first to rate this app and get the discussion started!